After a refurbishment at Appledore Shipyard and receiving new engines in 1986, she began her journeys for passengers and supplies to the island of Lundy. The Oldenburg is a graceful motor vessel, fast, comfortable and built on traditional lines. Below decks she retains her original panelling and brass fittings, but has been skilfully modernised to provide heated saloons, bar, buffet, shop and information centre. On board we have a bar, buffet, shop and information centre. The bar offers a wide range of drinks and a relaxing atmosphere, whilst hot and cold food is provided at the buffet. You can while away the time in our well stocked shop or find out more about the island at the information centre. The Oldenburg can carry 267 passengers and is available for private charter. 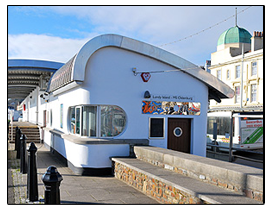 Whether for a cruise to Lundy, an evening river cruise from Bideford, a coastal cruise from Ilfracombe or can be chartered as a venue to hold private functions or conferences. Between March and October the island ship, MS Oldenburg, sails from Bideford and Ilfracombe, weather permitting. From November to March a helicopter service is operated between Hartland Point and Lundy. Visitors staying on Lundy will require return transport tickets, which should be purchased no later than 14 days prior to travel. Payment for accommodation on the island does not entitle you to transport to the island. Passages can be secured only by buying a ticket, which should be done when your final payment is due (usually three months before your departure). If you do not wish to travel on a day when transport is provided, it may be possible for you (usually at greater cost) to charter suitable boats in Bideford or Ilfracombe, or a helicopter. We can provide further details. The start and end dates of your booking must correspond with the sailing or the helicopter timetable. If you do not arrive on MS Oldenburg, we will charge you for carrying your luggage to and from the top of the island. Our Lundy Shore Office is always delighted to answer queries, or help with any particular requirements you may have. The telephone number is +44 (0) 1271 863 636. They can be contacted between 9am and 5pm Monday to Friday. Lundy has 23 holiday properties to choose from sleeping between 1 and 14 people. These include a lighthouse, a castle and a Victorian mansion. Many of the buildings are constructed from the island's granite. All have heating and many also have wood burning stoves with a bath or shower depending on size. Kitchens are fully equipped for those wishing to self-cater. The island also has a campsite, at the south of the island in the field next to the shop. It has hot and cold running water, with showers and toilets in an adjacent building.